Wellness is essential for everyone, yet it means different things to different companies and employees. Our goal is to work with your team to create programs that fit your company’s culture and needs, which can often mean reaching different groups of employees with a variety of programs and events. Given the right tools, environment, and support, employees can meet important health and wellness goals, which can improve healthcare costs, boost morale, and create a happier and healthier work environment. 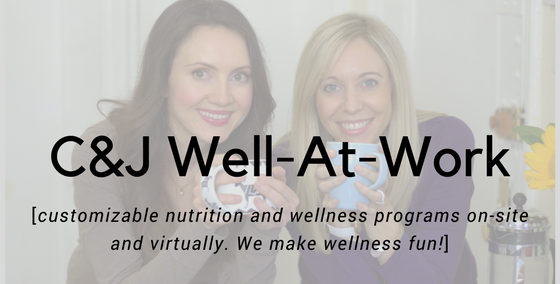 Whether you have 10 employees or 10,000, C&J Nutrition offers custom workplace wellness programs for organizations of all sizes. Our team of experienced registered dietitians, celebrity yoga and fitness instructors, and wellness experts deliver engaging programs across the country. We make wellness fun! Our conversational tone honed from years working with the media and magazine and publishing industry seeps into all of our programming and materials. We work with HR/benefits managers, benefits brokers/contractors, insurance providers, and foodservice operators. Our programs are engaging, with practical, instantly applicable information. Please get in touch with us for more information on how we can bring our modern and effective approach to wellness to your organization today.